Place the potato strips in a bowl of cold water for 20 minutes. Thoroughly dry and place on a rimmed baking sheet. Drizzle with oil, and season with salt and pepper. Roast at 400°F for 30 minutes, tossing half way through. Once roasted, transfer the fries to a plate. Wipe the browned bits from the pan and unroll the pizza dough onto the greased cookie sheet. Slide back into the 400°F oven to parbake for 8 minutes. Lightly brush the crust with oil, then sprinkle with mozzarella cheese and torn deli steak. Bake another 6 to 10 minutes, or until the cheese has melted and is browning and bubbly. Heat the gravy in a small saucepan. Arrange the fries on the pizza and drizzle with the gravy. Garnish with parsley, slice and serve immediately. For real, fries and steak and cheese and gravy on a pizza? Hold me back and call me Poutine Polly! I couldn't help it. It was calling to me. Begging me to. Giving me bedroom eyes. Caressing my every thought. Oh chill, I'm talking about this Poutine Pizza, YEW GUYZ. My mom is like, hyperventilating right now. Start by soaking some potatoes! Just thin strips in some cold water for about 20 minutes. Then pat them super dry and arrange them on a baking sheet. Like this! Give them a little oil, salt and pepper and roast away, bebe. Once the fries are done, snack on a few while you prepare the rest. 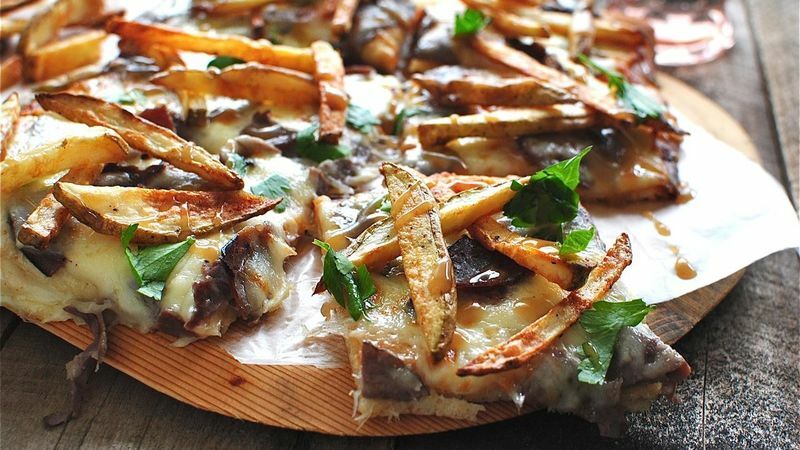 Unroll the pizza dough right onto the baking sheet that you roasted the fries on. Easy. Let her par-bake for about 8 minutes. Then sprinkle on the mozzarella, some torn deli steak, more cheese and more cheese. If you have curds, by all means, throw some on! Both my stores were out and I sobbed for hours. Then you'll just arrange the fries back on the pizza, garnish with a little parsley and drizzle with some hot gravy! Yeah, you need to eat this. Bev can't even get over it. A POUTINE PIZZA. Ugh. For more musings, visit her blog Bev Cooks and her Tablespoon profile.